Like most of Asia, Bhutan’s climate varies depending on its altitudes and is affected by monsoons. The climate is warm and humid in the southern plains and foothills. It is temperate in the inner Himalayan valleys of southern and central regions of the country. In the north, the climate is cold throughout the year with the towering Himalayan mountains perpetually covered in snow. Temperatures depend on elevations. 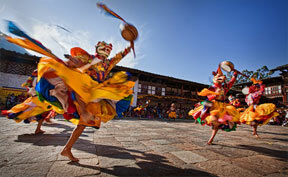 The capital city of Bhutan, Thimphu, is located at more than 2,200 meters above sea level. Its temperatures range from about 15°C to 26°C during monsoons, which fall in the months of June through September. And during winter, the temperature falls to at least -4°C. Thimphu experiences winter months from late November to early March. During this period, rainfall is rare. And the climate remains fiercely cold. The city gets its yearly snowfall sometime in February. Throughout the year, most of the central part of the country experiences cool and temperate climate. Temperatures in the south range between 15°C and 30°C during much of the year. However, sometimes the region gets very hot with temperatures crossing 40°C in summer. Like the unpredictable weather, rainfall also varies from place to place. In the north, the annual precipitation is recorded at just about 40 mm. In the central region, which is temperate, the average rainfall is recorded to be about 1,000 mm. And more than 7,800 mm annual precipitation is registered at some places that are humid and hot, especially in the south. Bhutan has three climatic zones: subtropical, temperate, and alpine. It has four seasons: spring, summer, autumn, and winter. Spring season, when Bhutan’s flora is at its best, starts from March till June. Most tourists visit the country during this time and autumn which falls in the months of September through November.